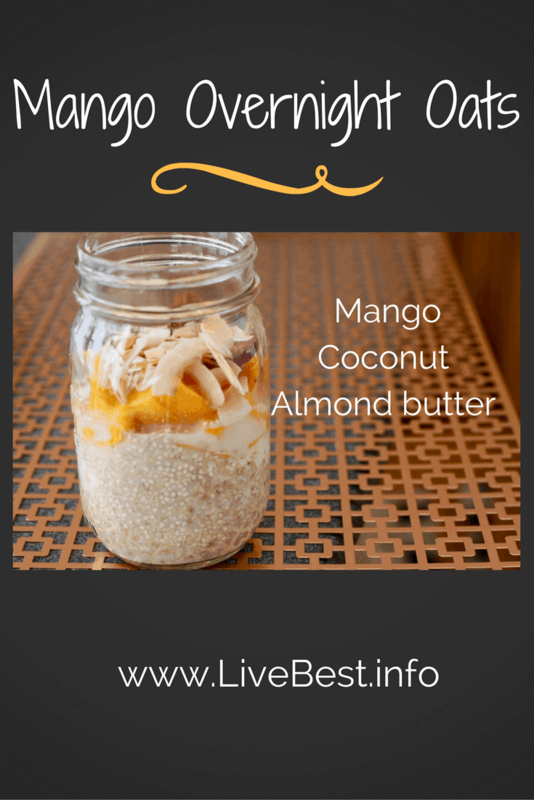 Wake up to overnight oats. Make your breakfast easy and your morning sane with whole grains, yogurt, fruits and more. Looks like I nearly slept through the overnight oats craze. Good thing I woke up in time, because this has amped up my breakfast routine. In my earlier days, I was not an oatmeal fan. I would dig for the raisins with the oatmeal and ate the oatmeal that clung to them. But once they were gone, so was I. Oatmeal reentered the scene when I discovered steel-cut oats. The firm texture suited me better than the mush of old. But now I’m back to old-fashioned rolled oats. Uncooked. They create the base for overnight oats. Steel-cut can be used, but they are a bit toothsome, such as still on the crunchy side. I like overnight oats because there is something new in every bite. As you see below, the combinations are unlimited. That is another bonus, if you have family members build their own, there are no dissatisfied customers. We make ours after dinner and no two are the same. I’m on a mango and strawberry kick right now. My husband prefers bananas and blueberries. I’m almond butter; he’s peanut butter. He’s flavored yogurt; I’m plain. You can get carried away and boost the calories into, say, lunch, so the jar helps limit that. I use a pint-size jar with a handle; his is a little bigger. Half-pints for kids. In the end, we find that the combination of protein-rich milk, yogurt and nut butter and fiber-filled fruits and grains help keep us full longer. No growling stomachs at 10:30. 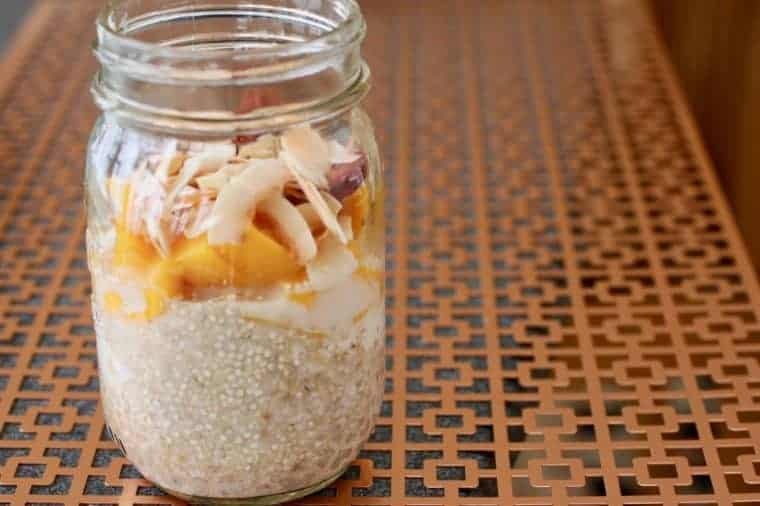 Because this is a make-ahead recipe, overnight oats make it easier to rise and shine by taking some of the stress out of the morning rush. That benefit continues since they keep up to 3 days in the refrigerator. 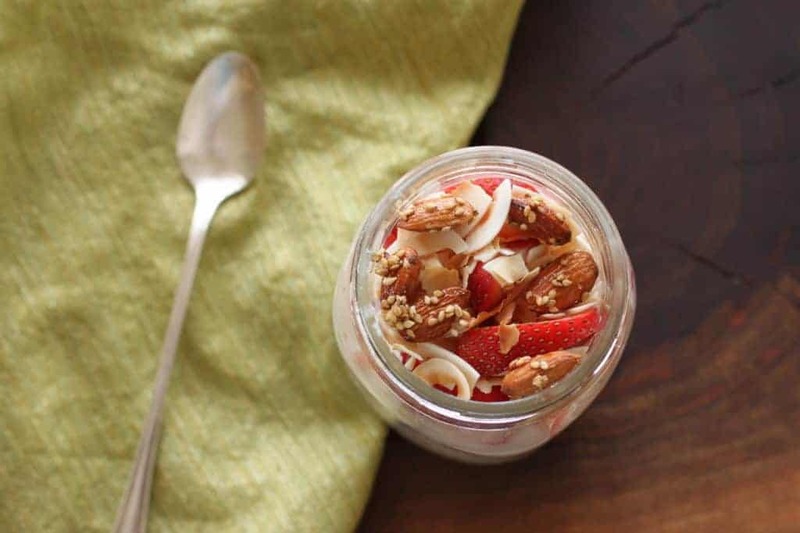 Strawberry Coconut Overnight Oats with Salted Honey Sesame Almonds. Uh, huh! 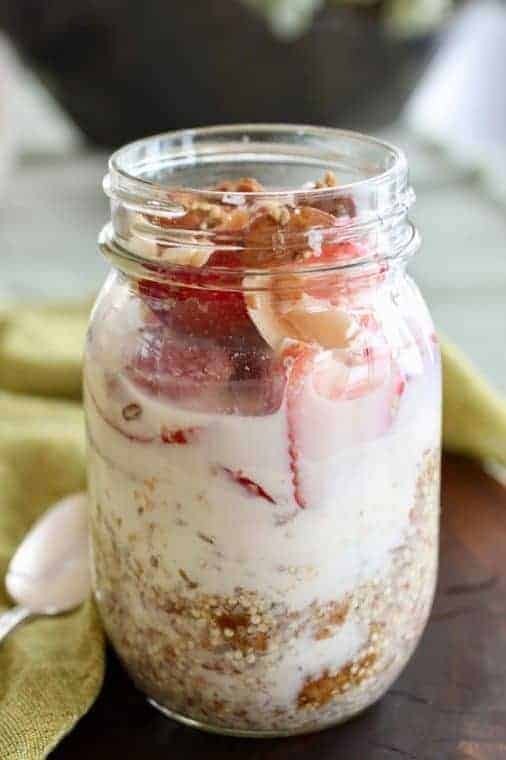 Layer food in Mason jar. More specifically, start with grains on the bottom so the milk and yogurt softens the grain. It’s okay to mix and match the suggested ingredients. Have fun and experiment. 1/3 cup raw whole grains: rolled oats, bulgur, or, if you want a little crunch, steel-cut oats. Pinch to 1/4 teaspoon spice: ginger, turmeric, cinnamon, cardamom, vanilla, pepper. 1-2 tablespoons nuts or seeds: quinoa, almond butter, peanut butter, hemp seeds, flax meal, walnuts, sunflower seeds, sesame seeds, millet, amaranth. 1/3 cup yogurt. Mix plain with flavored to keep sugar levels reasonable. If you don’t want yogurt, replace with more milk. 1-3 teaspoons flavor: honey, cocoa powder, instant coffee, maple syrup, jam, apple butter, orange juice, agave, chai, chocolate syrup, crystallized ginger, coconut, crumbled graham crackers, orange zest or salted honey sesame almonds. 1/2 -1 cup fruit: strawberries, mango, peaches, blueberries, bananas, pumpkin, pomegranate, cranberries, apricots, or cherries (fresh, frozen canned, dried, they all work). Vegetable ideas are shredded carrots or chopped spinach. Note: If you like crunch, save the nuts or seeds to add in the morning. You might top with a sprinkle of granola or toasted coconut. If you want hot oatmeal, try Berry Cardamom Baked Oatmeal. I will definitely try this. Looks delicious! Hey Jackie, how are you? Good to know this appeals to you. Thanks for weighing in. I recently revamped by site and the text color changed. I’ll reexamine but appreciate your note. Hey Brian, check out the print. It’s darker so hope it’s easier to read! What are you cooking?